Tonight, I came across an interesting blog post by Fellow MVP, Todd Klidnt in which he explains how to work around the 16 MB limitation for file indexing in SharePoint 2010 using PowerShell. “As with previous versions of SharePoint, SharePoint 2010 will not index the contents of files larger than 16 MB. There are a couple of reasons for this such as network usage pulling large files across and the time it takes to break them apart”. Click here to continue to the post. Unfortunately, this query just ignores the RowLimit and returns all the data from the external data source and not only the first 10 items as specified in the query. This is a known issue! When publishing Excel Workbooks that contains PowerPivot objects, a real Analysis Services cube is generated on the fly, you don’t believe me? 1. 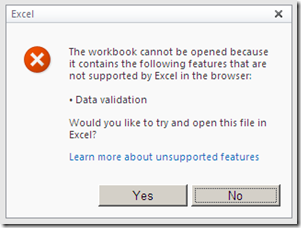 Install the PowerPivot Add-in for Excel 2010 and use it to create a workbook. 2. Publish the workbook to a document library which is marked as a trusted data source (Unlike MOSS 2007, All SharePoint sources are trusted by default in SharePoint 2010 as shown below). 3. 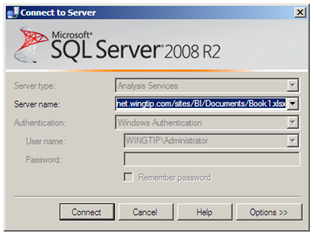 Open SQL Server Management Studio, click Connect > Analysis Services and type the URL of the workbook you just published and click Connect.